Flat hull, large cockpit, functional interior, and, finally, tiller steering again: The XP-33 marks a return to the sporty roots of X-Yachts, who look to add to the success of the X-99. Denmark during winter is gray, cold, and foggy. Yet the excitement couldn’t be any higher: The brand new XP-33 is ready to be taken for a test sail. Even though it’s not set up as a one-design class, it is the reincarnation of the legendary X-99 and the new yardstick for boats in the 10-meter size range. So, is it equally well suited for cruising and racing? The XP-33 is beamy and hard-chined aft, but the rudder keeps its grip even at pronounced heel angles. The boat is pleasant enough on the outside, with a low freeboard that put it closer to its ancestors than her siblings the XP-38 and XP-44. Yet it is plain that she’s a member of the performance line. The shape of the large windows in the cabintop resembles those of the other XP-models. The design team led by Niels Jeppesen created a distinctive hull shape with lines that are strongly reminiscent of French boats like the JPK 10.10. Not just because the 33 sports a fashionable hard chine aft, but because it is the first X with a retractable carbon fiber bowsprit. This is a nod to the cruising crowd and smaller crews, as it makes handling large asymmetrical downwind sails easier than wrestling a spinnaker. But for the racecourse there’s the option for a traditional setup as well, so the boat should be competitive against symmetrical-spinnaker boats in mixed fleets on windward-leeward courses. In the beginning it’s necessary to sort things out a little while getting familiar with the boat. What strikes immediately is the enormous stability. Even with two guys working on the genoa on the side deck, the X barely heels, which is a sign of a fairly beamy waterline, as the keel doesn't provide any righting moment at such small heeling angles. At least in port, the 33 derives quite a bit of form stability from a flat distinctive U shape. How stiff and stable the boat really is becomes evident right after the sails are hoisted. 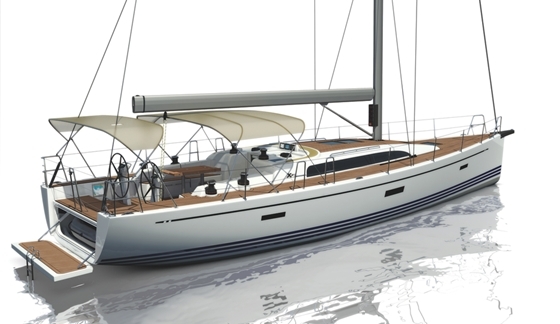 The 1.90-meter deep T-shaped keel and its 1.7-ton lead bulb counterbalance the 64 square meters of full upwind canvas. At 15 to 17 knots of breeze the X barely heels 25 degrees without the full crew weight on the rail, while the rig produces plenty of power. 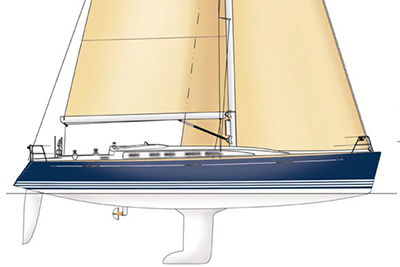 The layout emphasizes a big racing cockpit and minimal accommodations, with an open forepeak that serves as a sail locker. Forepeak bunks can be added as an option. Without the fine adjustment and the ratchet, the mainsheet needs an iron grip, despite its 6:1 ratio and the attachment point close to the boom end. The helm feeling is all the more convincing, directly transmitting each change in pressure from the rudder blade to the helmsman. Two fingers on the perfectly balanced tiller extension are enough to keep the boat on the edge of the breeze as it willingly follows the course. But the best aspect is that she’s tame and easy to steer, nearly intuitive. Loss of control as a consequence of a detached flow on the rudder is an alien concept here. Even with intentionally increased heel and weather helm the XP-33 stays on track. “We wanted a fast boat that thrills experienced sailors on the race course, while it still should be easy to sail with a small crew on weekends,” explains X-Yachts’ quality manager Dan Pedersen. Part of that concept is the cockpit layout. Moving the tiller aft by 1.3 meters via push rod creates more space for a large crew, with the helmsman sitting athwart the rudderstock, in a position that is similar to a boat with wheel steering. From there he/she has a clear view of the telltales in the jib and a chance to brace when the boat is heeled. In front of the helm there’s space for the main trimmer, who has his own footrest . On the test boat the arrangement of traveler sheet and backstay adjustment was not optimized yet, but on the production boats all these “throttles” should be within reach of the trimmer. If the crew size shrinks, the helmsperson can use the reach of the tiller to move forward to trim the main and help the crew during maneuvers. However, the standard jib winches are not ideal for cruising and are better replaced with the self-tailing models, which cost 630 euros extra. 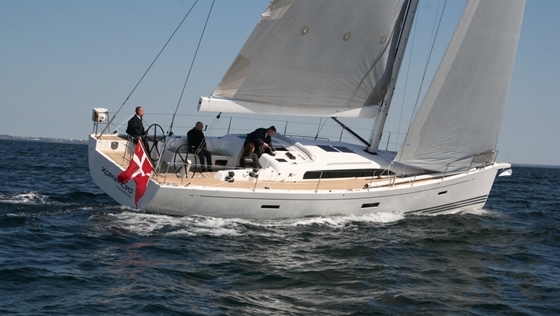 The rest of the sailing hardware is well-sized and positioned as it is typical for X-Yachts. Weekend sailors will take delight in the high and protective coamings at the forward end of the cockpit. Unfortunately, we had to deal with a strong current during the test, which made it impossible to produce exact numbers in support of the sailing performance. The instruments were not calibrated and the current influenced the GPS data. The VPP numbers promise 6.7 to 6.8 knots closehauled. Comparing the numbers of the speedo and the GPS adjusted for the current make these claims look credible. The theoretical tacking angles of 38 degrees appeared to coincide with the observations on board. Like all boats that have a shorter chord-length in the keel fin, the X wants to be kept moving during maneuvers. Luffing after a tack will only turn the bow. Yet the boat is well-mannered and the keel never loses the attached flow in bumpy seas. Sometimes the boat bucks, which might not be very comfortable, but it isn’t slow either. The abrupt motion stems from the weight concentration amidships and the carbon rig. The optional composite mast from Hall Spars (19,000 euros) lacks the dampening effects of a heavier aluminum spar. The interior is simple and linear. The saloon table can be removed and kept ashore while racing. Apropos of weight, the builder touts the light and strong structures that result from vacuum infusion, vinylester resin, and the carbon frame. Sales brochures, however, advertise a displacement of 4.4 tons, which isn’t spectacularly light for a boat of this size. Compared to the X-35, the new boat even appears heavy. In reality, the wide stern takes a toll, because it produces the same hull area as that of the larger model, according to Jeppesen. The test boat, which was equipped with a warm-water system, a forward berth, a fridge, and a holding tank, weighed 4,270 kg. So the numbers in the brochure were too high, which is a rare exception. After beating to weather, the bowsprit is deployed. The very solid carbon tube pulls the gennaker tack about two meters forward of the forestay, which is sufficient to gybe the sail inside. Hoisting the gennaker increases the anticipation. Will it get her on a plane? 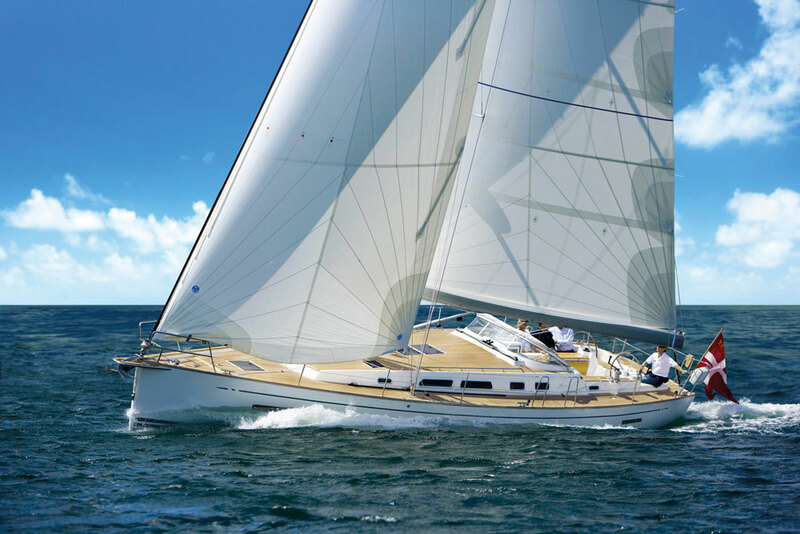 The pull of the 93-square meter sail makes the speedo jump to 8 knots. A tighter angle brings it to 9 in gusts, even 9.5. But that’s all there is in theses conditions. 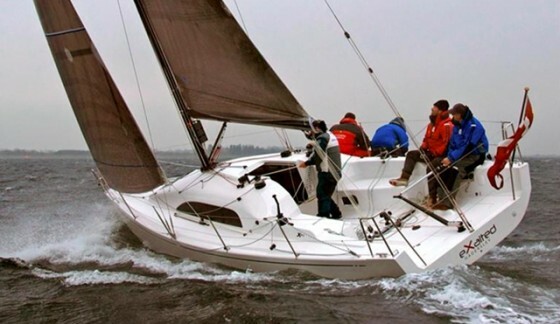 Two things impress: First, the perfect flow of the water that smoothly detaches at the stern with only minimal disturbance by rudder and keel. Second, the small X shows a near stoic propensity to follow the rudder. As if sailing to weather, it is easy to steer the boat in precise fashion. Too much pressure can be felt on the tiller and a quick pull is enough to bear off -- no sign of limits. Such behavior builds trust and turns each puff into a passing lane. Simply step on the accelerator and pick a suitable wave. For regattas, the spinnaker might be preferable, but gennaker and bowsprit are definite assets for fast reaching on weekends. 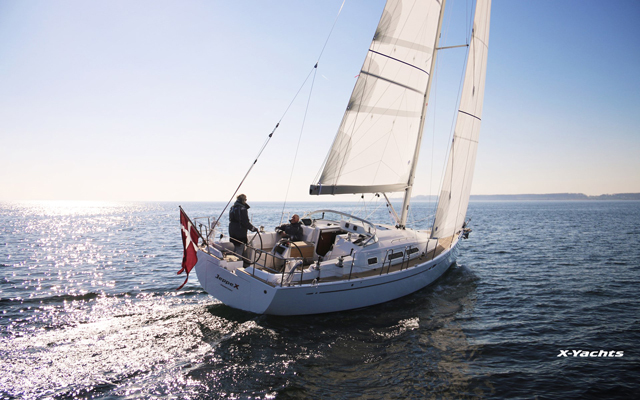 While the XP-33 impresses with sailing fun and performance, the interior drops off measurably. Belowdecks the boat is practical, but without any real innovation. The ambience is dominated by white fiberglass surfaces of the interior liner and the supporting structures of the settees. Wherever wood is used, it’s the Fineline teak veneer with matte varnish and an even grain. The glassed fiddles in the forward quarters on the half bulkheads, in the galley, and in the nav station clearly compromise the look and feel, partly because of the sloppy bonding of the vinyl coverings on the inside of the hull. The fact that the tested boat was Hull No. 1 and was finished in a rush might help to explain it, but it was still not very pretty. Standing headroom is only 179 centimeters (70.5 inches) measured right next to the companionway, where the floorboards are a couple of centimeters lower. This produces a small step. The standard model does not include a V-berth in the bow. Forward of the main bulkhead there is only the toilet, a sink, and the open sail locker. Sleeping in the bow costs 2,200 euros extra, which buys a decent double berth that folds up for racing. Also a bit on the Spartan side is the saloon. There’s enough space at the table to seat four for a meal, but with six adults it gets quite cozy. The table can be removed to stay ashore when racing. Stowage is scarce, as batteries and water tank occupy nearly all the space under the settees. Ordering removable cabinets and cubbies for cruising will add another 2,300 euros. The ship’s cook needs to be well organized since space is also limited in the galley, which also lacks efficient ventilation. Cooking fumes and vapors can only escape through the open companionway hatch. The small windows in the aft berths will do little to improve the climate, as they have to remain closed when it rains. 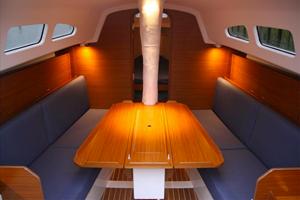 Lavish by comparison is the navigation desk, includinga dedicated seat to starboard of the companionway. But here too a choice has to be made between storage or cruising comfort, as the optional fridge occupies the shelf under the chart table. Sailing fun at all costs? Rationally it is difficult to make the case for the XP-33, as the base price of 125,000 euros can’t be called a bargain. 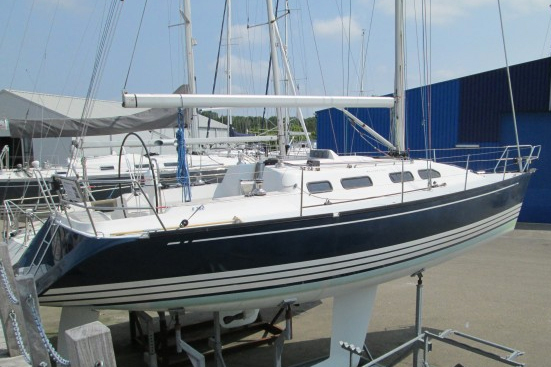 For a boat that’s ready to sail, 143,000 euros are due. Seen up close she hardly offers anything more than a J/97 or a JPK 10.10. The argument that the high cost of acquisition for an X commonly is balanced by good resale value might offer some comfort, but it won’t diminish the necessary investment. Still, X Yachts has succeeded with this boat. 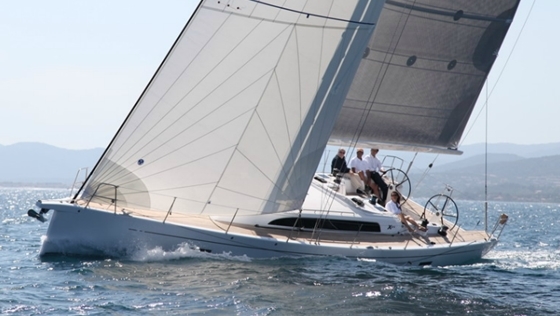 An extraordinary combination of perfect sailing balance, speed potential, and accommodations make this perhaps the most honest and multi-functional X in a long time.